National University of Criminal and Security Sciences - Bunyoro-Kitara Kingdom (Rep. Uganda) - The most powerful Kingdom in East Africa! We believe everyone is entitled to a quality, affordable education -- regardless of what grade point average might have been. Instead, our team of instructors and advisers are dedicated to helping you maximize your future potential. We just have a few basic prerequisites for each programme. All of our programmes are available on an open enrollment basis, so you don't have to wait for a new semester to begin. Just send us the application and you can get started right away. 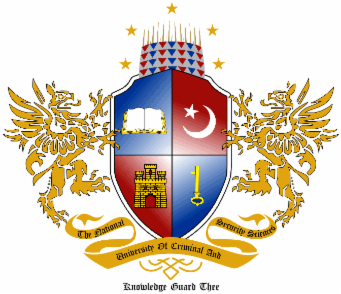 The NATIONAL UNIVERSITY OF CRIMINAL AND SECURITY SCIENCES (NUCSS) of BUNYORO-KITARA KINGDOM is a project of The National Council of Criminology of Pakistan (NCCPAK) working since year 2003 for the promotion of the subject of criminology in the country. NCCPAK promised to launch such institution at an appropriate time. Now the time has come to fulfil our promises that we did to the criminologists and academia of the world. This will be the first ever institution of its unique nature in Bunyoro Kitara Kingdom and in whole African continent. The institution comes with the latest subjects taught in the field of criminology, homeland security, forensics, criminal justice system, law and other security sciences. With the passage of time, the world needs more and more such sciences that deal with the peace of the society. A few adventurers have pushed this poor world into a hell and to face the consequences, we have to be well equipped--mentally and physically. The NUCCS is going to equip the persons with such knowledge which will trace out the factors of such disorder in the civil society, terrorism and un-restness around the globe and will teach you the way we have to encounter that insurgency in our society. The NUCSS is going to equip the persons with such knowledge which will trace out the factors of such disorder in the civil society, terrorism and un-restness around the globe. NUCSS has very qualified members on its faculty list. These persons are experts of their fields and are closely related with the fields of criminal sciences and homeland security. We are devoted to fulfil our promises. This is also our promise that we will deliver the best possible education to those who really need it. We are not doing business rather accomplishing our duties. This university has taken birth from a professional organisation and we know the professionalism. The NUCSS is an institution of higher studies where you can get the quality education-online and in campus. We will bring you the best courses under the supervision of professionals of criminology and homeland security. We have a programme that focuses on the application of clinical and criminal laboratory science, investigative techniques, and criminology to the reconstruction of crimes and the analysis of physical evidence. It includes instruction in laboratory science, laboratory procedures, criminology and police science, evidentiary testing and analysis, computer applications, record-keeping, reconstruction techniques, evidence handling and storage, and applications to specific types of evidence, law and crimes. The NUCSS is dedicated to serving our communities by recognising the diverse needs of individuals. We encourage personal and professional development through respect, appreciation and a commitment to general education as a foundation for life-long learning. As an Institution of Higher Learning, The NUCSS is committed to preparing students to be active, productive and successful contributors to a global community.